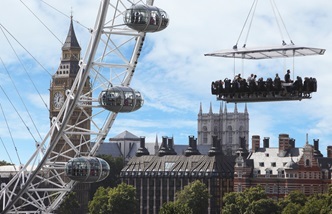 We asked chef and restauranteur Tom Aikens how he felt about hosting one of the chef’s tables at the 2015 London in the Sky event; a unique dining experience where chef, kitchen and guests float 25 metres above London’s South Bank. No stranger to hard graft in the kitchen, Tom Aikens became the youngest chef at 26 to win two Michelin stars, and now has an impressive UK and international restaurant portfolio to his name. He’s battled through culinary competitions such as TV’s Great British Menu, and personal feats such as running the Marathon des Sables (six marathons across the Sahara desert in just five days), but now he’s facing an altogether different challenge; cooking a full menu for 22 guests while harnessed to a kitchen-platform suspended from a crane 25 metres above London's South Bank. 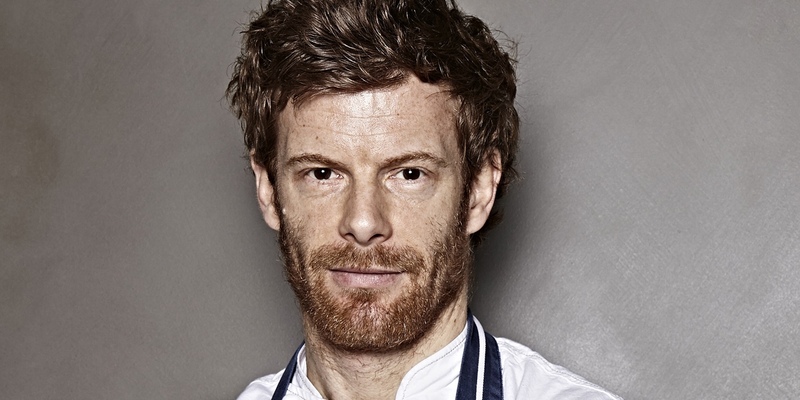 Chef Tom Aikens should already be fairly familiar with the South Bank. His Tom’s Kitchen restaurant at Somerset House is just across the river, serving up his classical British and European food with hints of his renowned creative and innovative flair. Key dishes on his menu include seasonal bouillabaisse and gazpacho, triple-cooked chips, and grilled fish and meats on the bone, but cooking and plating them on a limited kitchen while open to the elements is quite a different matter. The current menu for the lunches and dinners Tom will be serving include starters of a home-cured venison carpaccio and a jasmine-cured salmon, a main dish of Yorkshire jugged hare leg, and a dessert of apple and vanilla panna cotta. What's the most unusual place you have served lunch or dinner so far? That was at the San Pellegrino cooking cup in Venice, in July 2006. It consisted of two simultaneous races: a 10-mile yacht course and a culinary contest. We were 10 Michelin-star chefs cooking in the tiny on-board galleys, trying to rustle up the best three course meal before our boat crossed the finishing line. I had brought an organic lamb all the way from Britain, which I was planning to cook with courgette flowers, baby aubergines, artichokes, sage, green and purple basil, shallots, lavender, and fresh borlotti beans. It was not long after we set off that I started to feel really queasy. The smell of frying garlic bulbs and artichokes, combined with the searing temperatures below deck were hard to stand, and I soon started to delegate the easy tasks to the crew, spending 15 minutes in the galley, 15 minutes up top. Our boat crossed the line in third position, after four hours of bumps and jumps. We took the slowest route to the judges to leave me the time to plate, and three hours after dropping the dishes off I had the incredible surprise of receiving the Venetian glass plate as the newly crowned winner. Which dishes do you feel most challenged about preparing 25 metres in the air? Probably the Fermented barley, roasted artichokes, wild mushrooms and sabayon, as it is quite a delicate dish, which requires cooking most of the ingredients last-minute on site. Fermented dishes seem to be bang on trend right now - how did you come up with this idea for fermenting barley? It’s a great way to give a dish an acidic taste and to almost lighten it where it would have seemed heavy. The grains are fermented with beer and a little live yogurt. Most wheat grains are more easily digested when they are fermented. There are two cured dishes in your London in the Sky menus - what tips do you have for people who want to cure food at home? Lay half of your seasoning mix on a flat baking tray, place your meat or fish on top, skin side up and cover with the remaining seasonings before wrapping it in cling film. Place a light weight on top and leave in the fridge for a day. Make sure you scrape off all the marinade and dry it very well. For fish, this is now ready to eat. If it is meat, hang it in a cool, airy place for two weeks. Your jugged hare sounds delicious, where do you source your hares from? It comes from Celtic Fish and Game, which provides Tom’s Kitchen with produce such as pheasant eggs and specialist meats, all coming from local shoots. Many people shy away from panna cotta as they are scared it won't set properly, what are your tips for a perfect set? It is all a question of timing and being patient. You should let your ingredients infuse for at least 20 minutes. Make sure you bring them back to a simmer before you incorporate the bloomed gelatine as if the mixture is cold it will firm up immediately and come out with a lumpy texture. Tom will be cooking at London in the Sky for lunch and dinner services on the 29th and 30th September 2015.